Was a founding member of Trials Inc.
Was an active member of Trials Inc for many years. Was active in vintage trials. Bill always had a smile on his face and was fun to be around. His pioneering efforts in the sport helped give us the club, Trials Inc. Active Trials Inc. member since 1970's. Longtime Trials Inc. area rep and trials master. Established several different T.I. Riding areas. Performed trials demos and promoted trials for years. Multi time T.I. national trials master. T.I. Sportsman of the year. At time of induction, has ridden 227 T.I. Trials events since 1992. Many, many more before that. N.A.T.C. National champ senior 45+ 1995 & 1997. N.A.T.C. National champ Clubman 2014 and Sr. Clubman East series 2017. T.I. Champ class champion 1981 & 1984. T.I. Expert class champion 1993, 1994, 1995, 1996, 1997 & 2001. T.I. Advance class champion 2011 & 2012. 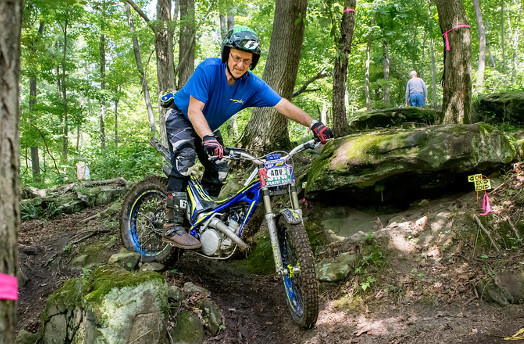 Gil is a true Trials legend, he has been a tireless supporter of anything trials. He has mentored many young riders into the sport. When it comes to comparing Gil to other people in our sport, well, there's only one Gil!